Black's Law Dictionary defines the phrase "on or about" as a phrase used in reciting the date of an occurrence, to escape the necessity of being bound by the statement of an exact date. I like that phrase! I will use it to help describe Moi's Books About Books Collection, short for Moi Bibliomaniac's Books About Books Collection. More people prefer the phrase "books on books" than "books about books." Google the former and you will receive on or about 2,540,000 results. Google the latter and you will receive on or about 377,000 results. But if you perform the search in Google Books mode, the results are much different. You will receive on or about 32,400 results for "books on books" and on or about 58,500 results for "books about books." From these results, I would venture to say that more bibliophiles prefer "books about books" over "books on books." Now I can't tell you exactly when I started collecting books about books –– it was sometime in late 1985 –– but I can tell you the exact title and other bibliographical data of my first book about books: The Best Books: A Reader's Guide to the Choice of the Best Available Books (About 50,000) in Every Department of Science, Art, and Literature, With the Dates of the First and Last Editions and the Price, Size, and Publisher's Name of Each Book. A Contribution Towards a Systematic Bibliography by William Swan Sonnenschein, London, 1896. This book is known simply as Sonnenschein's Best Books. My wife found this book for me one weekend in late 1985 on the bargain table in Trinder's, a bookstore in a seventeenth-century building in Clare, England. I paid £1 for it, about $1.30 in American money. I can also tell you when I first launched a website to display Moi's Books About Books: on or about Nov 21, 1999. It was the first of five webtv websistes I would create to display my book collections. Its name? –– you guessed it–– Moi's Books About Books. Today I display a catalog of Moi's Books About Books on Library Thing, along with my other collections. Yes, Moi's Books About Books is my largest collection –– 937 books (1,109 as of 11/15/15) –– almost one-third of my entire library. Most of the books in Moi's Books About Books Collection are on the seven shelves along the south wall of my library. Six of these seven shelves are exactly twelve inches high. On the top shelf are Books About Books specifically selected because they are less than nine inches high. Almost touching the ceiling is a spare set of Lowndes's Bibliographer's Manual of English Literature, 5 books of essays by Augustine Birrell, 7 books from Henry B. Wheatley's Book-Lover's Library Series, and an assortment of other smaller books, some of them belonging to other collections. The next three rows below house what are mostly anecdotal books about book collecting arranged in alphabetical order. Some of these books, you will notice, are part of My Sentimental Library Collection as well. Having started collecting books while stationed in England in the late 1980s, English bibliophiles are well represented in Moi's Books About Books Collection: P.B.M. Allen, A. St. John Adcock, Augustine Birrell, Richard Booth, John Hill Burton, John Carter, Cyril Davenport, Thomas Frognall Dibdin, Austin Dobson, Gilbert Fabes, Percy Fitzgerald, R. S. Garnett, Frederic Harrison, W. Carew Hazlitt, Alexander Ireland, Andrew Lang, Sir John Lubbock, Alfred W. Pollard, J. Roger Rees, and J. Herbert Slater to name more than a few. And I have not ignored American bibliophiles in forming Moi's Books About Books Collection: William Harris Arnold, Nicholas Basbanes, Luther Brewer, Eugene Field, Anne Fadiman, H. George Fletcher, Helene Hanff, Laurence Hutton, Holbrook Jackson, Adrian H. Joline, David Magee, Brander Matthews, Christopher Morley, A. Edward Newton, William Dana Orcutt, Jean Peters, Lawrence Clark Powell, A. S. W. Rosenbach, Harry B. Smith, Vincent Starrett, William Targ, and John T. Winterich, to name more than a few. 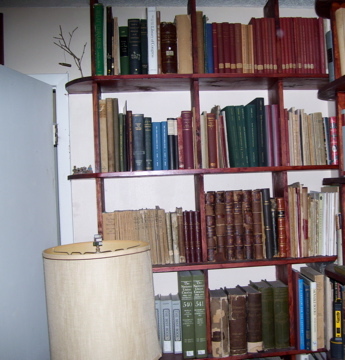 Below those shelves is a shelf containing my reference books on book collectors, booksellers, publishers and printers. 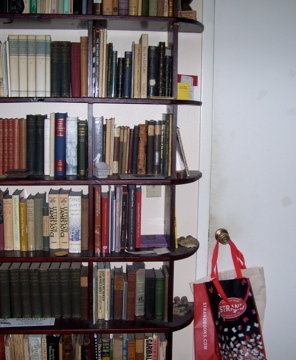 Below that shelf is a shelf containing my books about bookplates, bookbinding, papermaking, and bibliography. On the bottom shelf are more bibliography books and some of my book-related periodicals. On the floor below these seven shelves is my bookbinding equipment: two hot foil stamping machines, four boxes of letter type, two sewing presses and one finishing press. On the east wall, to the right of the door are five shelves designed to store my oversized books. 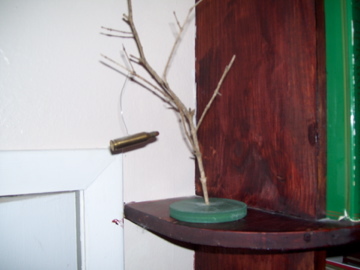 Each shelf is on or about fifteen inches high. All but a few books on the top shelf are books by or about the Library of Congress. Below that shelf are books about other libraries. On the next shelf are the auction catalogues of two famous American book collectors: John Quinn and Robert Hoe. Also on this shelf are some of my oversized book-related periodicals. The next shelf contains more bibliographies and more oversized book-related periodicals. On the bottom shelf are oversized books, mostly from collections other than Moi's Books About Books Collection. ––– Maestro! Christmas music please! It's –– A C-a-r-t-r-i-d-g-e in a B-a-r-e T-r-e-e. . .
. . . Speaking of books. . . The remaining association copies from Moi's Books About Books Collection stand in the first section of the seven shelves on the east wall to the left of the door of my library. This is the section where most of the books of My Sentimental Library Collection are located. The other sections contain my Charles Lamb, Samuel Johnson, James Boswell, and Mary Hyde Collections. These seven shelves are the same dimensions height-wise as the seven shelves on the south wall of my library. Below my work desk, and well out of foot range, are two big brown wicker baskets containing more book-related periodicals and loads of bookseller catalogues. On the floor on the west wall in front of a bookcase containing my New York, Elements of Style, and Language Resources Collections is another big wicker basket containing still more bookseller catalogues. And below my library table are more baskets containing fine press books and yes, more book-related periodicals. And that, my friends, is a view of Moi's Books About Books Collection!